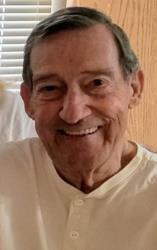 On a sunny Saturday morning, the 17th of November 2018, Kelvin Wilfred McKay, 82, of Elephant Butte, NM was sitting in his favorite lazy boy chair, reading a western and dozing off when: our Dad, a Husband, a Son went quietly to join his wife, Mary Jane (Nee Brown); his parents, Joseph Wilfred and Emma Elizabeth (Nee Welsh); and his sister, Donna Margaret Coyle (Nee McKay). Dad’s first love was playing hockey and when he wasn’t on the ice, you’d find him working diligently building a boat down at the lake. His love of the water is what brought him to Elephant Butte to retire. He was pretty good at cards too, however, he never beat mom. He’s been a member of the Moose since 1987. He is survived by his daughters - Louellen West, Kelly Jane McKay, and Teri Lynn McKay; his nieces – Catherine, Michelle and Cheryl Coyle; his grandchildren – Jason, Stacy and Stephanie West, Scott Johnson and Jamie Maxwell (Nee Johnson), Tanner John Ashton and Spencer Lynn Rasor; and his great-grandchildren – Shade and Kaia West, Moxie and Marty Maxwell. At Dad’s request, no funeral services will be held. A special thank you to all his friends and the Ambercare hospice staff. For those who prefer, donations may be made to the March of Dimes in his memory. My deepest condolences to the McKay family, may you find comfort in prayer and the beautiful words of Isaiah 25:8 where God promises us that He will soon eliminate all death and suffering.